1) Adjust oven racks to upper-middle and lower-middle positions and preheat oven to 225degreesF. 2) Line 2 baking sheets with parchment paper. 3) Combine 3/4 cup sugar and 2 tsp. cornstarch in a small bowl. 4) Finely chop 2 oz of bittersweet chocolate and set aside. 5) In a standing mixer fitted with a whisk attachment, beat 4 egg whites, 3/4 tsp vanilla extract and 1/8 tsp salt at high speed until very soft peaks start to form ( the peaks should slowly lose their shape when the whisk is removed), 30 to 45 seconds. With the mixer running at medium speed, slowly add the sugar mixture in a steady stream down the side of the mixer bowl (the process should take about 30 seconds). Add the finely chopped bittersweet chocolate in the same manner. Stop the mixer and scrape down the sides and bottom of the bowl with a rubber spatula. Return the mixer to high speed and beat until glossy, and stiff peaks have formed, 30-45 seconds. 6) Working quickly, place the meringue in a pastry bag fitted with a 1/2" plain tip or a large zipper-lock bag with 1/2" of the corver cut off. Pipe meringues into 1 1/4" wide mounds about 1" high on the prepared baking sheets, 6 rows of 4 meringues on each sheet. 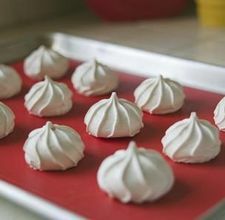 1:30 Bake meringues 1 hour, rotating the baking sheets front to back and top to bottom halfway through baking. 1) Beat 4 eggs in a small bowl. 2) Fill a second bowl with 2 cups of bread crumbs. 3) Dip each camembert portion in egg, then bread crumbs, then egg, then bread crumbs. Put on a plate and refrigerate until needed. 1) In a small saucepan, blend 2 tsp cornstarch with 1/3 cup water. 2) Add thawed blueberries, 1/4 cup sugar, and 2 tsp. lemon juice. Simmer until the liquid thickens, adding additional cornstarch-water mixture as needed. 3pm Slice, peel and cube cantaloupe, then wrap each cube in 1/2 slice of prosciutto. Store in the refrigerator in an airtight container, with a damp paper towel on top to keep the meat from drying out. 1) Chop 1 1/2 cups onion and set aside. 2) Chop 4 tsp. fresh sage and set aside. 3) Melt 2 Tbsp. butter in a large pot over medium heat. 4) Add 2 lbs. classic-cut peeled carrots and chopped onion; saute until onion is soft, about 8 minutes. 5) Add 6 cups vegetable broth; cover and bring to a boil. Reduce heat, uncover, and simmer until carrots are tender, about 10 minutes. 6) Working in batches, puree soup in blender until very smooth. Return soup to pot. 7) Stir in 1 cup orange juice, 2 Tbsp. brandy and chopped sage. Simmer 5 minutes for flavors to blend. 8) Season to taste with salt & pepper. Store the soup on the stove, and gently reheat when your guests arrive. 1) Prep ingredients: Slice 2 lbs. onions. Chop 2 Tbsp. fresh thyme. Peel and thinly slice 2 1/2 lbs. potatoes. Peel, halve, core and thinly slice 2 lbs. apples. 2) Preheat oven to 400degreesF. 3) Butter 13x9x2" glass or ceramic baking dish. 4) Melt 6 Tbsp. butter in large nonstick skillet over medium heat. 5) Add onions, thyme, and 2 tsp. salt; saute until onions are translucent, about 10 minutes. Increase heat to medium-high; saute until onions are tender and begin to color, about 8 minutes longer. Remove from heat. 6) Add 6 Tbsp. butter, 2/3 cup water, 2/3 cup wine, and 4 tsp. sugar to onions in skillet; stir and swirl skillet to combine and melt butter. 7) Bring to a boil, then cool the onion mixture to lukewarm. 8) Combine potatoes, apples and onion mixture in large bowl; toss gently to blend. 9) Transfer to prepared baking dish, spreading evenly. Cover dish with parchment paper, then cover with foil, shiny side down. 10) Bake gratin until potatoes are tender, about 55 minutes. Remove from oven and store on stove (you will pop it back in the oven, uncovered for another 20 minutes before you are ready to serve). 1) Prep ingredients: Trim and slice bok choy. Rip and measure two separate 2/3-cup-portions basil leaves. Finely chop shallots and set aside. Shell the shrimp. 2) Bring large saucepan of water to boil. 3) Add bok choy. Cook until crisp-tender, about 1 minute. 4) Drain bok choy, quickly rinse with cold water, then set aside. 5) Blend 1 cup coconut milk, 2/3 cup basil, 12 sprigs cilantro and 6 kaffir lime leaves in food processor until herbs are finely chopped and loose paste forms. 6) Make white rice, using a rice cooker, or following package directions. Set aside until ready to serve. 6:45 Open your bottles of Bordeaux and let them breathe. Preheat oven to 400degrees. 7pm When your guests arrive, offer them a glass of Bordeaux while you head to the kitchen. Heat 1 Qt. peanut oil in small saucepan or fondue pot, begin gently warming your soup, gently warm your blueberry sauce, uncover your gratin and pop it in the oven. Once the peanut oil is up to temperature, deep-fry the breaded camembert until lightly crispy. Plate individual appetizers - prosciutto-wrapped melon, fried camembert, and blueberry sauce - and serve. 7:20 Remove gratin from oven and let cool. Check the soup and turn off the heat if warm enough. 7:30 Serve gratin and soup and pair with glasses of moscato. 7:45 Return to the kitchen to prepare the curry. 1) Heat 2 Tbsp vegetable oil in a large skillet over medium-high heat. 2) Add shallots and 2 tsp. Thai green curry paste; stir 30 seconds. 3) Add herb paste and 3 Tbsp. minced lemongrass; stir 1 minute. 4) Add remaining coconut milk, 5 Tbsp. fish sauce and 2 Tbsp. brown sugar. Bring to a boil. 5) Add shrimp and bok choy. Simmer until shrimp are opaque in center, about 2 minutes. 6) Mix in 2/3 cup basil leaves. Season with salt & pepper, and serve over rice. Pair with Chablis. 1) In a saucepan over medium-low heat, combine four 12-oz bottles of Sam Adams Cream Stout and 12 Tbsp. brown sugar and bring to a gentle boil, cooking for about 3 minutes. 2) While the beer is cooking, pour the water out of the martini glasses, run a lemon wedge around the rims of the glasses, and dip the rims into a saucer of granulated sugar until the desired amount of sugar has collected on the glass. 3) Reduce the heat under the saucepan to low and whisk in 8 oz semisweet chocolate chips and 1 tsp. chile powder, whisking until melted. 4) Pour into the warmed sugar-rimmed martini glasses and serve with the meringues.